Canada is not a typical budget-friendly country, that's for sure. But with careful planning, we were still able to enjoy its beauty without robbing a bank. Please note that we visited Canada in a party of four and if you're on a tight budget we do suggest to find fellow travelers to share the cost. Be aware that in Canada you will find prices in shops without GST so you'll pay more at the counter than advertised. GST and provincial taxes are different in every province. Prices below are in US dollars - $ and Canadian dollars - C$. In total, we traveled 12 days in Canada before we crossed borders to the USA. Our total spending was $78 per person per day without flight tickets and insurance. We do not calculate those two items as it is too individual. Total cost is calculated for two people. Return flight tickets from Munich to Seattle cost $685 per person. Sometimes it is cheaper for us to drive from the Czech Republic to Germany or other neighboring states and park a car there than to fly directly. Also, flight tickets to Seattle, USA were less expansive so from Seattle we took a bus to Vancouver. When traveling to USA and Canada, as citizens of the Czech Republic, we don't need to apply for a tourist visa (check online if your country is in Visa Waiver Program), and we could stay in the country up to 90 days. The only fees are ESTA when traveling to the USA by air - $14 and ETA for Canada - C$7. We slept in a campervan, and the rate usually was C$25 - 40 per night per one unserviced camping spot (you will pay the same price per spot for 1 to 4 people). We didn't make reservations in advance so purchasing mobile app WikiCamps Canada for $2.79 was very helpful to find the right place to spend a night. Renting a 5-seat campervan turned out to be a great idea. It was four of us, and two could sleep inside the car and two in the folding tent on the roof. The rent including all fees cost us $111 per day (the same car which sleeps two people cost around $99). The fuel in Canada cost around C$1.1 per liter. We drove a little bit less than 2500 km in Canada, so the total bill for fuel was C$357. For the bus from Seattle to Vancouver, we paid $17 per person. Except for one or two meals out we cooked for ourselves. Eating out in Canada is expensive when not considering fast foods where we usually don't go. Prepare to pay for lunch without drinks C$15 - 30 per person in a no fancy restaurant. We did a lot of shopping during our travels. Cooking was much cheaper and also more convenient than eating out as we slept in camps. Food prices are very similar as in Europe or the USA. The shopping cost more in smaller tourist mountain towns such as Jasper. We also had to purchase gas and few things for cooking. 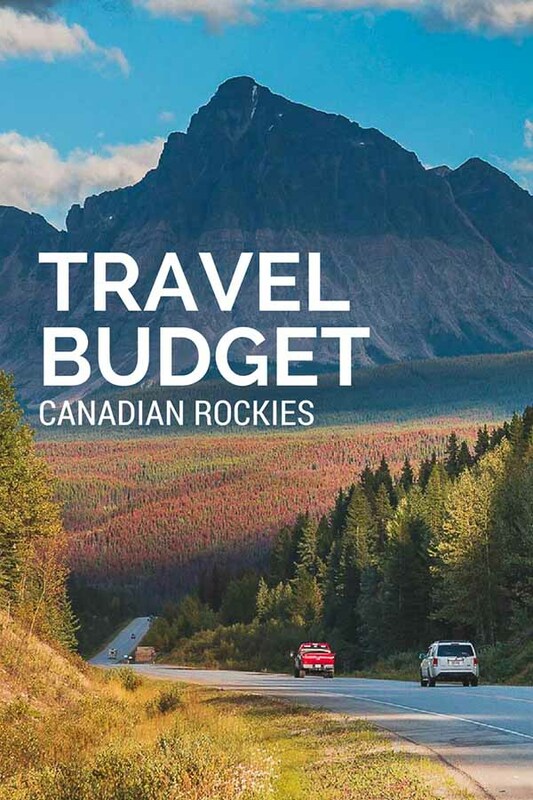 We were self-sufficient with our car and didn't feel it's necessary to buy a tour in the Canadian Rockies. You can surely do whale watching near Vancouver, or walk the icefield on Athabasca Glacier but for us, it was too expensive for what it had to offer. The only activity we paid for was the soak in Miette Hotsprings and Radium Hotsprings. Visit cost approximately C5-10 per person plus rental if you don't have swimsuit or towels. To visit parks, we had to purchase Discovery Pass valid for two years. The pass cost C$136.40 and is valid for the group (car up to seven passengers). There were no other entrance fees as we stayed outdoors only and were not seeking any cultural activities this time. Bear spray was around C$40, and although we did not use it, we felt much safer with it. It is good to have reliable windproof jackets and warm sleeping bags if you are camping. The temperature drops significantly at night. We never leave home without insurance covering all activities we are planning to do. It cost $50 per person per our whole trip.